(Nanowerk News) Thanks to an interdisciplinary team of researchers, scientists now have a more complete understanding of one of the human body’s most vital structures: the red blood cell. Led by University of Illinois electrical and computer engineering professor Gabriel Popescu, the team developed a model that could lead to breakthroughs in screening and treatment of blood-cell-morphology diseases, such as malaria and sickle-cell disease. The group published its findings in the Proceedings of the National Academy of Sciences. 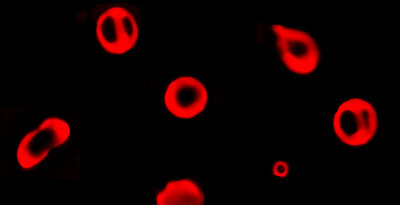 A research team led by electrical and computer engineering professor Gabriel Popescu used a novel measurement technique called diffraction phase microscopy to reveal the mechanics of red blood cells. Red blood cells (RBCs) are unique in structure – a doughnut-shaped disc full of the oxygen-carrying molecule hemoglobin but none of the intracellular structures of other cells, not even DNA. In circulation, RBCs must contort to squeeze through capillaries half their diameter. Their flexibility and resilience come from their membrane structure, which couples a typical lipid bilayer with an underlying matrix of protein. However, knowledge of the membrane’s mechanics is very limited. The research team used a novel measurement technique called diffraction phase microscopy, which uses two beams of light while other microscopes only use one. RBC membrane movement can be observed through typical light microscopes, a phenomenon known as “flickering,” but Popescu’s team was able not only to see nanoscale membrane fluctuations in live cells, but also to measure them quantitatively – a first. In addition to normal cells, the team also measured two other morphologies: bumpy RBCs called echinocytes and round ones called spherocytes. They discovered that these deformed cells display less flexibility in their membranes, a finding that could provide insight into mechanics and treatment of diseases that affect RBC shape, such as malaria, sickle-cell disease and spherocytosis. With collaborators from UCLA, the group used its data to construct a new model of the RBC membrane that accounts for fluctuations and curvature, a more complete and accurate rendering than previous models that treated the membrane as a flat sheet. The team’s technique eventually could be used to screen for blood diseases such as malaria or to screen banked blood for membrane flexibility before transfusion, since stored blood often undergoes cellular shape changes. In addition, this novel microscopy technique has important implications for researchers interested in membrane biology and dynamics, according to Catherine Best, co-author of the paper and instructor in the U. of I. College of Medicine. “An advantage to studying red blood cells in this way is that we can now look at the effects of chemical agents on membranes, specifically. It is very exciting. For instance, we can look at the membrane effects of alcohol, and we may learn something about tolerance to alcohol,” Best said. Because diffraction phase microscopy measures live cells without physically manipulating or damaging them, it also could be used to evaluate medications being developed to treat blood cell morphology diseases, according to Popescu. “We can study the mechanics of a single cell under different pharmacological conditions, and I think that would be ideal for testing drugs,” he said. The National Institutes of Health and the National Science Foundation funded this research, which included collaborators from MIT, Harvard Medical School, the University of Colorado, Harvard University and UCLA.